This chamber concert will feature the music of Ellen Taaffe Zwilich, along with works from Arvo Pärt, Frederic Voorn, Chris Cerrone, and Call for scores winner Juan Andres Vergara. 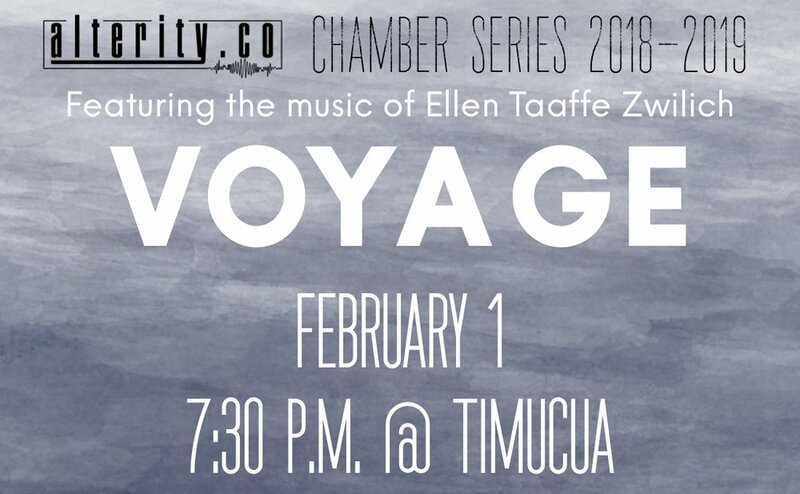 Voyage features the Alterity String section; Violinist Andreas Volmer, Violinist Caitlin Pequignot, Violist Charles Glazer, and Cellist Hanrich Claassen. YOU ARE FREE FEATURES ALTERITY CLARINETIST NATALIE GRATA AS WELL AS CARRIE WIESINGER ON FLUTE, CAITLIN PEQUIGNOT ON VIOLIN, GRACE GAVIN ON CELLO, AND WILL DANIELS ON PIANO. An evening of new music for wind quintet that started in 1478. Drawings and observations by Leonardo da Vinci, poems by Al Rocheleau, and music by Benoit Glazer. Flying Machine, A Suite, is an hour long 16 movement journey into the mind. Poetry to be read by Al Rocheleau! 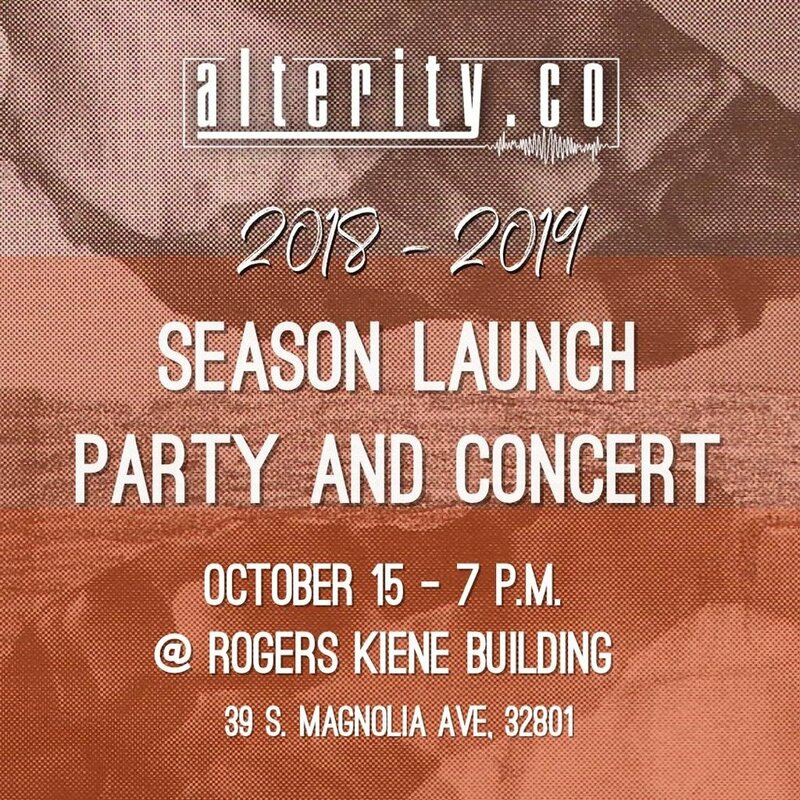 As part of the Marathon Concert presented by Accidental Music Festival, Alterity quintet will perform works composed by Orlando based composers Jeremy Adams, Erik Branch, and Sharon Omens. The performance will include introductions by the composers. Olivier Messiaen's Quartet for the End of Time was written while the composer was held in a prisoner of war camp during World War II. Writing for the only instruments and musicians available, Messiaen employed violin, cello, clarinet, and piano (avoiding the cello's missing string and one stuck key in the camp's piano) to create a sprawling and beautiful work "in homage to the Angel of the Apocalypse, who lifts his hand toward heaven, saying "There shall be time no longer." Cellist Christopher Erickson is an active solo and chamber recitalist, giving performances throughout the Midwest and the South, as well as a series of recitals in China. He has also performed as a soloist with the Dearborn Youth Symphony and the Bob Jones University Collegium Musicum. As a chamber musician, he has studied with and performed alongside members of the Pacifica Quartet and the St. Paul Chamber Orchestra and has received coaching from principal musicians in the Academy of St Martin in the Fields, the Orpheus Chamber Ensemble, and the Cleveland Quartet. During his graduate studies, his quartet twice won the Macauley chamber music competition at the University of Louisville, and in 2013 the members of the quartet were featured as Artists-in-Residence at the Chapel Hill Chamber Music Workshop. Performing in numerous orchestras, Chris has served as principal cellist of the Bob Jones University Orchestra and Collegium Musicum, the University of Kentucky Symphony Orchestra, and the Brevard Music Center Sinfonia. He is currently a member of the Orlando Philharmonic Orchestra and the faculty of Saint Andrew’s Conservatory of Music. Tanner Johnson is a violinist and multi-instrumentalist from Portland, OR. His dynamic performance style has captivated audiences in concert halls and clubs around the country. He studied jazz performance at the prestigious Berklee College of Music. He performs regularly with bands and orchestras around Central Florida, and is a regular performer at Disney World. Tanner has been teaching violin for 10 years. He thoroughly enjoys working with young instrumentalists to help them gain an understanding of their instrument, while helping to nurture a love for music that will last a lifetime. His hope is to bless his community with creative and captivating music that nurtures a loving and beautiful environment for generations to come. Praised as “a remarkable musician” by Michael Barone, host of NPR’s Pipedreams, Deniz Uz has distinguished himself as a young artist of versatility through his activities as conductor and keyboardist. A Florida native, Deniz currently resides in Orlando where he is one of the region’s most sought-after collaborative pianists, working regularly with Opera Orlando’s Studio Artists and professional opera singers in the area. 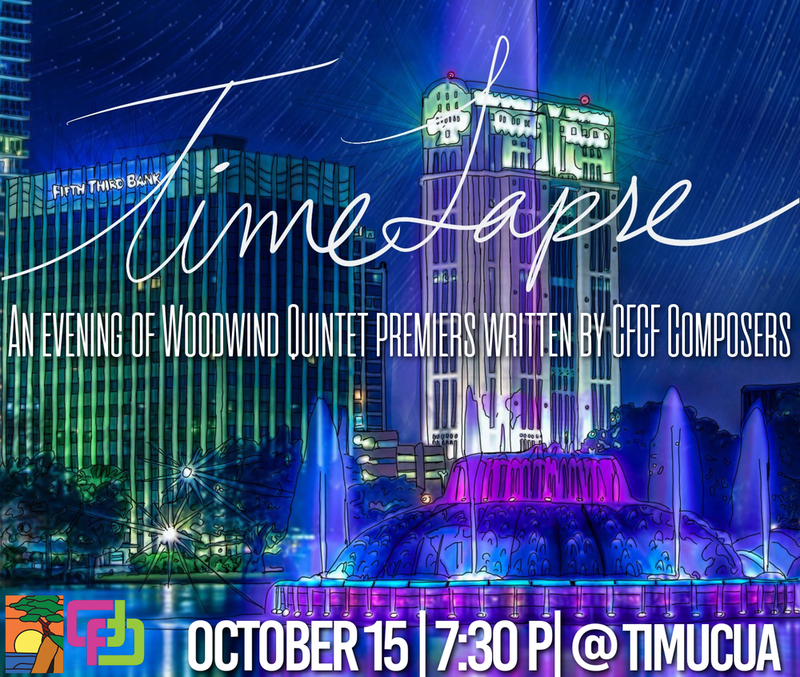 This season, he was chorus master and rehearsal pianist for the Orlando Philharmonic production of Leonard Bernstein’s Candide. Deniz has also served as an assistant conductor for productions at Opera Orlando and is presently company pianist for Orlando Ballet. He has conducted in performances with the Budapest Symphony Orchestra, the Fort Wayne Philharmonic, and Sinfonietta Cracovia, and has participated in conducting masterclasses under Andrew Constantine, Samuel Jones, Jorge Mester, Colin Metters, Jorma Panula, and Ennio Nicotra. As organist, Deniz has made solo appearances at notable venues internationally, including the Great Hall of the Hochschule für Musik und Theater "Felix Mendelssohn Bartholdy" in Leipzig, Germany, Adolphus Busch Hall at Harvard University, and the Kimmel Center’s Verizon Hall in Philadelphia. Deniz received his BA in the History of Art from Yale College in 2014 and was valedictorian of his graduating class at the Interlochen Arts Academy in Michigan.